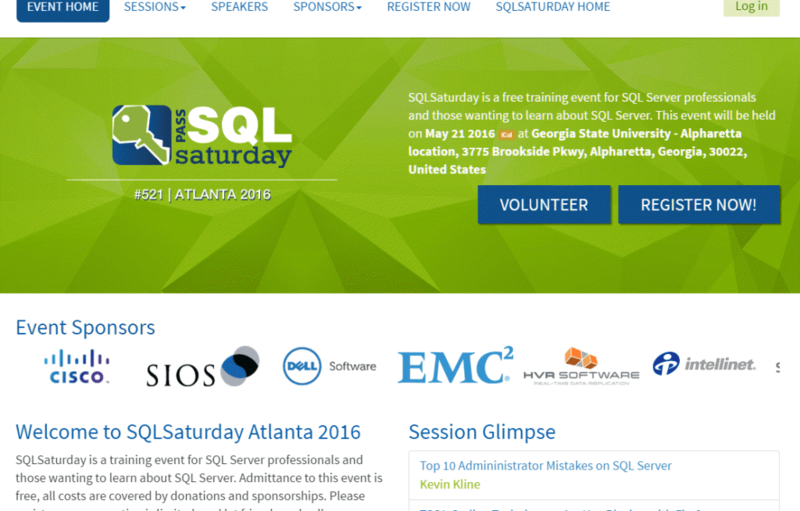 SQLSaturday events are a pleasure to be a part of whether it involves speaking or volunteering. Volunteering definitely takes more work and time, but to see someone who is interested in SQL Server as a career take time to learn on a Saturday, makes it all worth the effort. When speaking, I tend to gravitate toward those 3-5 in the front row that seem full of questions, and away from that 1-2 that seemed to “know” more than me. Friday May 20th 2016, I have be selected to present a full-day session on Reporting with Dimensional Modeling and Microsoft Business intelligence. These are called pre-conference sessions which reflects their purpose at larger conferences like PASS Summit. What makes them more attractive to attendees (AND Bosses) is the fact that you do not have to travel to the larger conference plus they are usually less expensive. This translates to a higher ROI (Return On investment) for you or the company you work for. 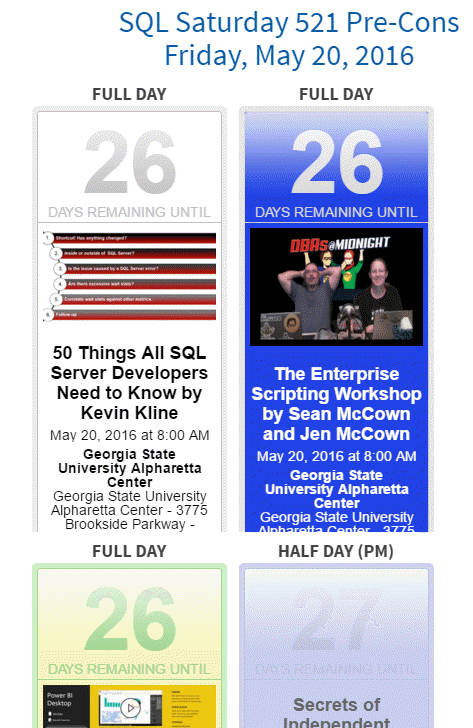 Atlanta’s SQLSaturday this year is May 21st 2016 at Georgia State University in Alpharetta just north of Atlanta. 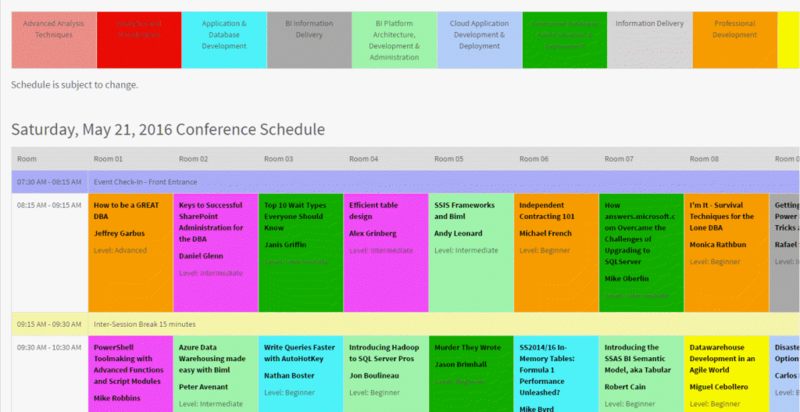 The speaker lineup is incredible and I know half my day will be attending sessions to advance my knowledge with the Microsoft data Platform plus talk about Transitioning from a DBA to Data Warehouse Architect. If you are interested in learning about dimensional modeling and MSBI, please register for the day long pre-conference session I am giving, or you might be interested in the other 2 all-day sessions – Enterprise Scripting by the Midnight DBAs (Sean and Jen McCown) or SQLSentry’s Kevin Kline on 50 Things All SQL Server Developers Need to Know. There is also a half-day session on Friday presented by Linchpin People’s Brian Moran talking about Secrets of independent Consulting. Of course, the Saturday event is free (you might have to pay for lunch). You could learn a lot of pertinent skills on Saturday as well as network with probably 500+ attendees and speakers along with sponsors and volunteers. Please come join us.